2013 was the year that Yahoo went on a spending spree first buying Alike and then later in summer cutting a check for a cool 1.1 billion USD for Tumblr. NSA hacking and spying that has been going on for years revealed by Edward Snowden in a Guardian exclusive, more details are still being revealed every week at the time of writing this post. Google Glass released in limited numbers for testers and quickly becomes a hit. 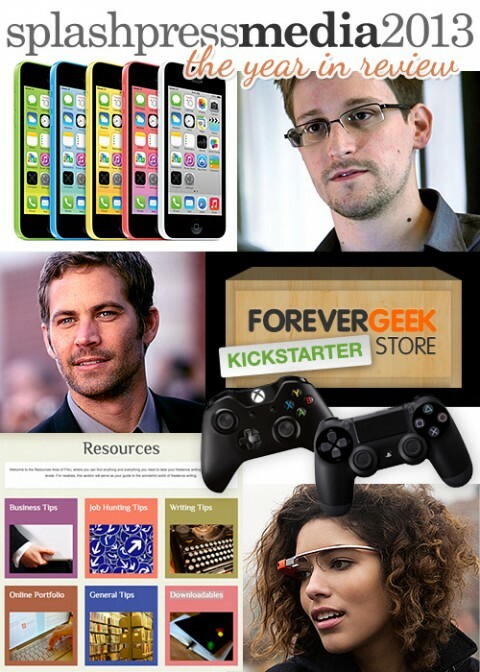 The Forevergeek Kickstarter Store is released – an online store and catalogue of all geek related Kickstarter funded products. The Xbox One and PS4 within a week of each other and each claiming to have sold millions within days of launch. Paul Walker of the Fast and Furious movie series is killed in a high speed car accident while returning with a friend from a charity event. We released a writers resource area at Freelancewritinggigs.com with tips and tools for both beginner and experienced freelance writers headed by and old FWJ hand Jodee Redmond. « Merry Christmas from Splashpress Media!